The Ford brand will get an aluminum-bodied Super Duty and several new high-performance cars in the coming year. Most of its lineup has been recently updated, and another significant round of redesigns is expected just before the end of the decade. F-150: If you haven't heard, the F-150 was redesigned for 2015 with an aluminum body that helped the truck drop 700 pounds from the previous generation. After lengthy retooling shutdowns at both plants that make the F-150, inventories are rising and projected to return to normal levels by the end of September. F-series sales volumes have fallen slightly because of the changeover, but transaction prices have soared, contributing to record North American profits in the second quarter. Ford is responding to customer demands for high-end F-150s by reintroducing a $60,000-and-up Limited trim for the 2016 model year. A Raptor high-performance version, unveiled in January, is on tap for 2016. Also new for 2016 is a sport mode and Ford's Sync 3 infotainment system to replace MyFord Touch. 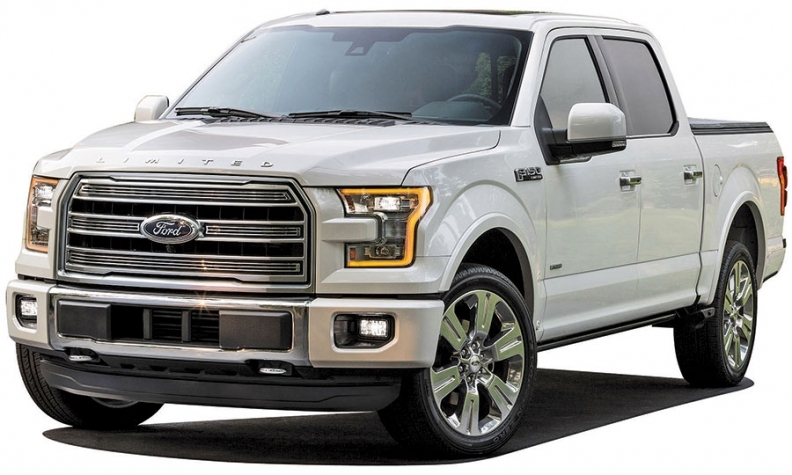 The F-150 will get Ford's new 10-speed transmission, developed with General Motors, probably for the 2017 model year. Click here to download a PDF timeline of Ford's product plans. Super Duty: Ford has said it's putting the Super Duty through the same aluminum lightweighting transformation that the F-150 underwent for 2015. It also may use a good deal of magnesium, as evidenced by a spectacular fire that immolated a Super Duty prototype last year. The lighter weight should create a good bump in towing capability and at least a slight increase in fuel economy. Ford may drop the 6.2-liter, V-8 engine, as it did with the F-150, but definitely will keep the 6.7-liter, Power Stroke, diesel V-8 that was recently revamped. Expect the Super Duty to be revealed at the State Fair of Texas in late September and production to start in May. Ranger: It's not coming back to the U.S. anytime soon, though executives have acknowledged they are studying the small pickup segment and watching how General Motors is doing in it. Transit Connect and Transit Connect Wagon: The Transit Connect gets Sync 3 for the 2017 model year, but no major changes are on the horizon. Currently built in Spain, the Transit Connect is one of the possibilities to replace the Focus at Ford's Michigan Assembly Plant after production ends there in 2018. Transit: The Transit, introduced to the U.S. in 2014, is far and away the leading commercial van in the U.S. this year, doubling up on the Chevrolet Express through July. It gets Sync 3 for the 2016 model year. E series: Mostly replaced by the Transit, the E series continues in cutaway and stripped chassis form for business customers. Subcompact crossover: Ford's U.S. dealers have nothing to compete with the recently introduced Chevrolet Trax and Honda HR-V. The most likely way to take care of that is to start importing the subcompact EcoSport -- possibly with a different name to reduce pronunciation confusion with Ford's EcoBoost engines -- from India. Don't expect it to arrive before late 2017, if not a year or two after that. Ford had to give the vehicle a hurried face-lift for the 2015 model year in response to poor sales in Europe, and it doesn't want to botch the launch here by rushing it. A recent report by The Economic Times of India said Ford is seeking suppliers to support building at least 90,000 EcoSports a year for the U.S., starting in October 2017. Escape: The 2016 version of Ford's top-selling crossover is one of the first vehicles to get Sync 3. A refresh is on tap for the 2017 model year. Spy photos show styling changes that borrow from the redesigned 2015 Edge, with a larger grille and narrower headlights. Inside, the gearshift moves from the instrument panel to the console between the front seats, creating more space for audio and climate controls. A full redesign of the Escape is expected in 2019, when it likely will be offered with a 1.5-liter, four-cylinder engine and nine-speed transmission. A hybrid version is likely to return at that time. Edge: A redesigned Edge went on sale in March as the first Ford vehicle to come with an EcoBoost engine as standard equipment. Ford gave the Edge a larger interior, improved its capabilities to allow towing with the base, 2.0-liter engine and added high-tech features such as park assist that works for both parallel and perpendicular spaces. After an abbreviated 2015 model year, the 2016 version gets Sync 3. Explorer: Sales of the Explorer have more than quadrupled since hitting a low point in 2009, at the end of the Explorer's life as a body-on-frame SUV. It was refreshed so substantially for the 2016 model year that Ford considers it to be a new generation. The three-row crossover has new front and rear styling, a more upscale-looking interior and a new, 2.3-liter EcoBoost engine. No Sync 3 until next year, though, because of an early start in production. Dealers began selling most trim levels over the summer, but the top-of-the-line Explorer Platinum -- with a sticker price of $53,495 including shipping -- arrives in September as Ford taps into growing demand for high-end utility vehicles. The Explorer likely moves to Ford's versatile CD6 platform with its next redesign in 2019. Flex: It's highly profitable, it sells well in California and it has a cultlike following among owners. But because the Flex is the Ford brand's least popular nameplate and rides on an ancient, Volvo-derived platform, it's unlikely to make it to a second generation. Sources said Ford recently gave the Flex a reprieve until late 2018, because why not squeeze as much revenue as possible out of this quirky, three-row crossover until retiring its platform when the Explorer gets a redo? Expedition: The Expedition and Lincoln Navigator will switch from steel bodies to aluminum shortly after the Super Duty, which is built at the same plant. A 2014 report on Ford's aluminum strategy from CLSA Americas analyst Emmanuel Rosner listed the changeover as happening in July 2016, but sources said it should actually be about a year later than that. Ford will be looking to finally gain some ground on Chevrolet, GMC and Jeep in the large SUV segment. Fiesta: Ford is due to redesign the Fiesta in 2018, when production is widely expected to shift from Mexico to Thailand. But sources say the company instead could replace the Fiesta with a new, Mexico-built, subcompact car, with or without the Fiesta name. Whatever route it chooses, Ford likely will offer a car that's larger than today's Fiesta to better compete with the Honda Fit and address complaints about a cramped back seat. It's expected to lose its dual-clutch transmission, another source of customer frustration, possibly to be replaced by a continuously variable transmission. Focus: Ford said in July that its Michigan Assembly Plant will stop building the Focus and C-Max in 2018, when they are redesigned. Focus production is expected to leave the U.S. for Mexico at that time, potentially replacing the Fiesta in Cuautitlan. Sources say the Focus will get a more rounded look like the Fiesta and also drop its dual-clutch transmission. The high-performance Focus RS, coming to the U.S. for the first time, arrives in 2016 for what is expected to be a two-year run. The RS will be imported from Germany, and its 2.3-liter, four-cylinder EcoBoost engine will generate more than 315 hp, but Ford hasn't divulged full specs yet. C-Max/new hybrid: Sales of the C-Max have plunged since Ford twice restated the car's fuel economy ratings and compensated owners for the discrepancy. Ford is working on a vehicle that likely would replace the C-Max in 2018 and be offered in a similar variety of hybrid formats but without the baggage of the C-Max name. The new hybrid, code-named C240, would be designed to take on the Toyota Prius more directly than the C-Max, which lost its marketing advantages when the mileage ratings were restated. It could be built at Michigan Assembly, along with other hybrid vehicles to replace Focus production. Fusion: Ford's best-selling U.S. vehicle after the F series will get a minor face-lift in 2016 to give it a more upscale appearance. Spy photos show new headlights, taillights and bumpers while the Aston Martin-esque grille remains. When it's redesigned in 2019, the Fusion likely will move to a smaller platform, making it lighter and more fuel efficient. Taurus: Ford unveiled a redesigned Taurus for China this year but has steadfastly refused to discuss the car's future in North America, where sales have fallen off significantly. It appears the current version of the Taurus, introduced in the 2009 model year and freshened in 2012, will remain on sale here for at least two more years. If sales here continue to slide, Ford ultimately could decide to pull the plug on a North American Taurus and instead focus on China, where large sedans are more appreciated these days. Mustang: Since the Mustang's redesign for the 2015 model year, sales have soared in the U.S. -- blowing away the Chevrolet Camaro, which is months away from its own overhaul -- and demand in overseas markets continues to grow. The Mustang Shelby GT350 and GT350R arrive this summer. The GT350, priced at about $49,000, mates a six-speed manual transmission with Ford's first-ever flat-plane production V-8, generating 526 hp and 429 pounds-feet of torque. The GT350R, a $13,500 upgrade, cuts 60 pounds by swapping the aluminum wheels for carbon fiber. The R also forgoes air conditioning, a back seat and an audio system to make it more nimble on the track. For the 2018 model year, the standard-issue Mustang may get a new front fascia and a 10-speed automatic transmission. A source said Ford will offer a Mach 1 edition around the same time. The next major update would be due in 2019 or 2020. GT production is limited to 250 a year. GT: The GT, quietly designed in a hidden basement room, will generate more than 600 hp with its twin-turbo, 3.5-liter EcoBoost V-6. 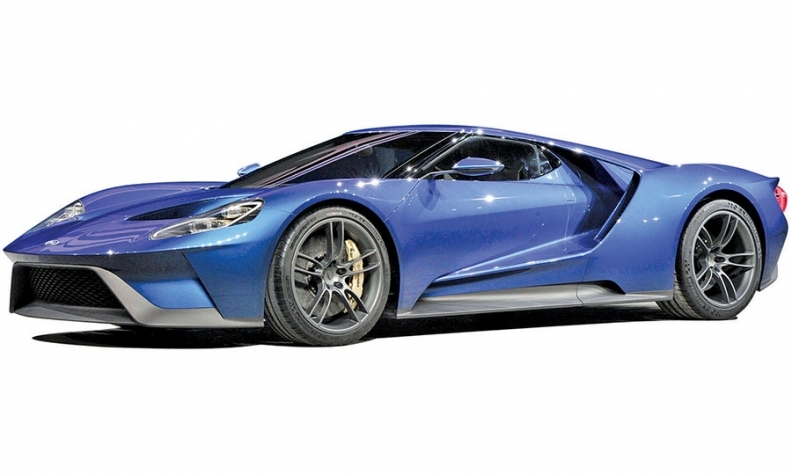 Ford will race the aluminum and carbon-fiber supercar in next year's 24 Hours of Le Mans and start selling it in late 2016, but probably not to you. Production will be limited to 250 cars a year, and the price is expected to come in around $400,000. They'll be made in Markham, Ontario, by Multimatic Motorsports.